How Much Does A Guitar Cost? Who Is The Best Guitar Player In The World? What Guitar Effect Pedals Do You Really Need? What Is a Guitar Humidifier and Why Should You Use One? Multi-Effect Pedals – Are They Worth It? 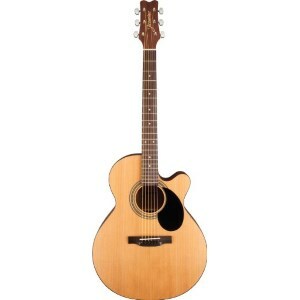 Whether you’re an amateur or a seasoned musician, you can always benefit from getting the best cheap acoustic guitar. Doing so allows you to play this instrument without investing a ton of money. However, the problem is that there are lots of great models made by legendary brands, and picking the right guitar is certainly not easy. The good news is that we’ve made it our mission to look at some of the most popular consumer choices so we can recommend the models that have the best sound and most features for the price. 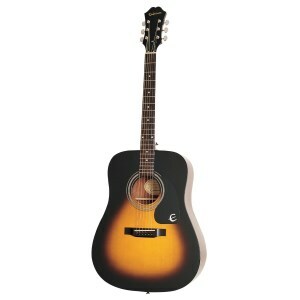 Our top choice is the Epiphone DR-100. This inexpensive guitar comes with an attractive dreadnought design, quality materials such as select spruce, mahogany, and rosewood, and it also features a 25.5-inch scale. 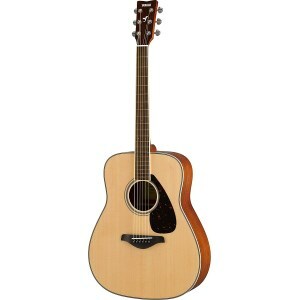 In the unfortunate event that this guitar is out of stock, you may also want to consider the Fender FA-100 Dreadnought. It is the perfect choice for newbies who are just learning the basics of a guitar. The top is made of fine spruce wood, suitable for playing numerous music genres. Spruce is a high-quality wood that will age well and will provide a good sound quality for your guitar many years from now on. The product comes with buttons if you want to attach a strap. Experienced guitar players may notice that the resonance of this item could use improvement. If you’re looking for a decent and affordable guitar to get you through the first lessons, the Epiphone DR-100 is a smart choice. The FA-100 comes with everything you need to start practicing your guitar skills right away. Apart from the guitar itself, you will also receive all necessary accessories, which makes this set the perfect gift for you or your loved ones. The top is made of spruce wood and comes with an X bracing pattern that delivers strength and richness to the sound. Some customers said the guitar was not properly strung, so you’ll have to buy additional strings. The set includes a gig bag, a tuner, additional strings, a strap, and the guitar, so it represents a great gift for newbies. If style is important to you, this guitar comes in various color options to best match your personality. It has a solid build, so it will last for many years. It is made of spruce and mahogany that will allow you to play both low and loud sounds, suitable for a variety of musical genres. The die-cast tuners will ensure the accuracy of the sounds you create. As with many other affordable guitars, you’ll have to pay attention to the strings that are flimsy. Yamaha is one of the most renowned brands in the world, providing high-quality musical instruments. This guitar is no exception. If you’re searching for a musical instrument that doesn’t cost an arm and a leg but don’t have the time to spend on reading dozens of cheap acoustic guitar reviews, then you’re in the right spot. We’ve showcased some of the most popular inexpensive models so that you can choose the perfect guitar for your needs as well as your budget. The Epiphone DR-100 is an affordable acoustic guitar that comes with everything you need to get started without having to break the bank. This model features a solid build and a dreadnought design that is perfectly suited to players who want a more powerful sound. 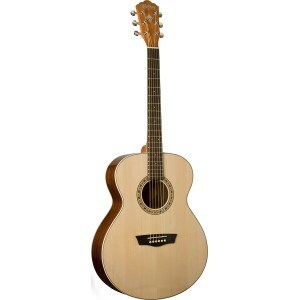 The top is made of fine spruce wood that makes this guitar great for a variety of play styles and musical genres. Spruce is well-known for its rich and complex tonality, as well as its ability to age well and sound even better after a few years. The body is made of mahogany while the bridge is made of rosewood which ensures great strength and resistance to the high stress that is usually present between the nut and the bridge. The guitar comes with a mahogany neck that is glued at the 14th fret as well as with a 25.5-inch scale, while the premium machine heads and die-cast tuners are resistant to high string tension and they allow you to easily tune the guitar. 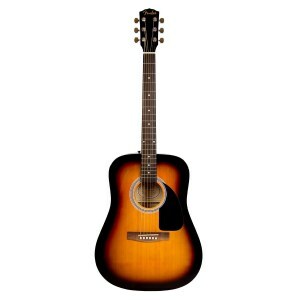 Made by the legendary Fender brand, the FA-100 is a guitar bundle that comes with a dreadnought guitar and other accessories you might need for your initial music lessons. Featuring an eye-catching sunburst finish and quality materials, this model is the perfect gift for anyone wishing to learn the ropes (or strings) of playing the guitar. This guitar has a top that’s made of spruce wood featuring an X bracing pattern which results in a more powerful and richer sound. The sides and back are made of agathis, while the bridge and fretboard are made of stress-resistant rosewood. Thanks to the chrome tuners, you get to finely tune your guitar so you can play accurate notes every time. This bundle also offers a chromatic tuner with a clip-on design for easier tuning, a pack with extra strings, as well as extra picks, so you never have to stop playing. You also get a strap for comfortable playing and a gig bag for easy and safe transportation. The descendant of the famed FG180, the new Yamaha FG820 is a guitar that offers a high-quality sound and great playability without being expensive. This guitar has a solid build and powerful features which make it the first pick for amateur and enthusiastic musicians alike. With a body made of Sitka spruce and back and sides made of mahogany, this guitar is capable of producing low-to-midrange loud and strong sounds that are suited to playing a wide range of styles. This versatile instrument owes its sound to the efforts of Yamaha engineers who have designed and implemented an improved bracing pattern. This instrument also comes with a rosewood fingerboard and bridge for increased durability and resistance to high stress, as well as diecast tuners which will ensure that each and every sound you play is accurate. The body also comes with a hand-sprayed natural finish for a beautiful look and an ideal gig partner. The Seagull Entourage is an acoustic guitar with an impressive design and a superior sound that offers incredible value to both veteran and amateur players. This guitar has been made in North America and benefits from high craftsmanship. With a beautiful Rustic polished finish, even the exterior of this instrument gives hints of its true musical potential. This model comes with a top that’s made of select cedar wood, and that has been tested for pressure resistance. A guitar suited to all levels, the Entourage features a slim neck and a 1.72-inch nut that will help even beginners learn basic chords quite fast. The custom polished finish will protect the wood of the guitar and help it age well without affecting its sound. In fact, this guitar will actually sound better over time. Thanks to the integrated Set Neck system, you get a more stable instrument that won’t twist or warp due to changing temperatures or humidity levels. With a solid build and capable of producing impeccable sounds, the Yamaha FD01S is the perfect acoustic guitar for a beginner. It has all the right features while also coming at a more than affordable price so that anyone can start playing it without making a considerable investment. The strong spruce top offers increased resistance to even demanding playing styles while also ensuring a warm tonality that you almost never find in this price range. The sides and back are made of eastern mahogany, while the rosewood fingerboard and bridge ensure superior resistance to increased stress. With its highly durable design, this guitar is able to keep on producing stunning sounds for many years to come.The metal tuning keys are easy to use, and you can keep your instrument well-tuned and accurate for both personal use as well as gigs. Measuring 99 inches in length, this full-size dreadnought is suited to beginners as well as intermediate guitar players. If you’re looking for a reliable guitar that is versatile and solid yet doesn’t cost a fortune, then the Jasmine S34C NEX is just what you need. Despite its accessible price, this guitar comes with an orchestra-like design with a cutaway that resembles the Venetian style, a natural satin finish, and is also quite capable of satisfying even more advanced guitarists. This instrument is easy to play, and it features a spruce top that benefits from the X bracing technology developed by Jasmine which contributes to a livelier sound. The back and slides are made of Sapele, while the bridge and fingerboard are made of rosewood for extra resistance to stress even from the most virtuoso player. Thanks to the slim neck profile and nut, this guitar is perfect for beginners or for people who have gotten accustomed to wider nuts. This guitar comes with a 25 1/2-inch scale length that makes it easier to play. Whether you’re just starting out or you’re already experienced in playing the guitar, the Washburn Harvest WG7S is a reliable model that comes with a quality design that’s meant to offer countless hours of pure musical joy to anyone interested in this beautiful instrument. With a solid Sitka spruce top and a gloss finish, this guitar will only improve its sound quality as years go by and as it is played more and more. With a tonality that’s hard to match in this price range, the WG7S ensures clean and lively sounds every time. The mahogany back and sides will help this instrument perform well for many years. The rosewood fretboard is strong, and it comes with 20 frets and a neck length that measures 25.5 inches. 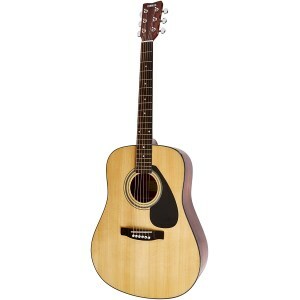 This grand auditorium guitar also features scalloped spruce bracing for improved sound quality and a longer-lasting top. This instrument also has a nut that’s made of strong ABS, a bridge made of rosewood, and chrome die-cast tuners. Whether you’re searching for one of the best acoustic guitars for beginners or a more refined instrument for your skills and level, finding the proper model is quite a difficult task to accomplish. There are loads of instruments made by legendary brands, each with its own features and advantages. This guide is designated to give you a few basics regarding this musical instrument that’s loved all around the world. Here are a few things you may want to consider before getting one of the new cheap acoustic guitars for sale. First of all, you’ll need to take into account your skill level, as well as intended use. You might want to get the best acoustic guitar from Yamaha as an upgrade, or an inexpensive model if you’re just starting out. For a beginner, a guitar that comes with a narrower neck and with a maximum of 18 or 20 frets is better suited than a full-size concert model. If you’re already experienced with guitars, then you surely want a full-size guitar, be it a grand auditorium or a dreadnought. Depending on your play style and specific needs, you might want to choose a model over another. 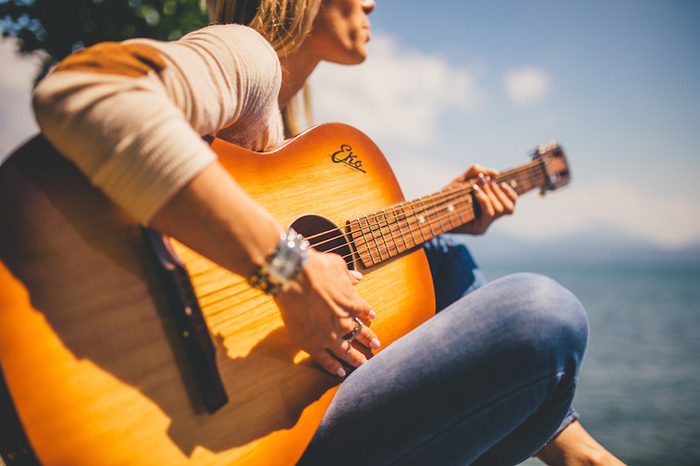 If you’re often traveling and busking in city centers, then a more compact guitar is ideal, as opposed to a musical instrument for gigs, where you want the best sound quality you can get from your guitar. The type and quality of the wood that the guitar is made of will affect the sound quality. There are heaps of options here, from the standard spruce to rosewood to mahogany and the more expensive maple, walnut, or even ebony. 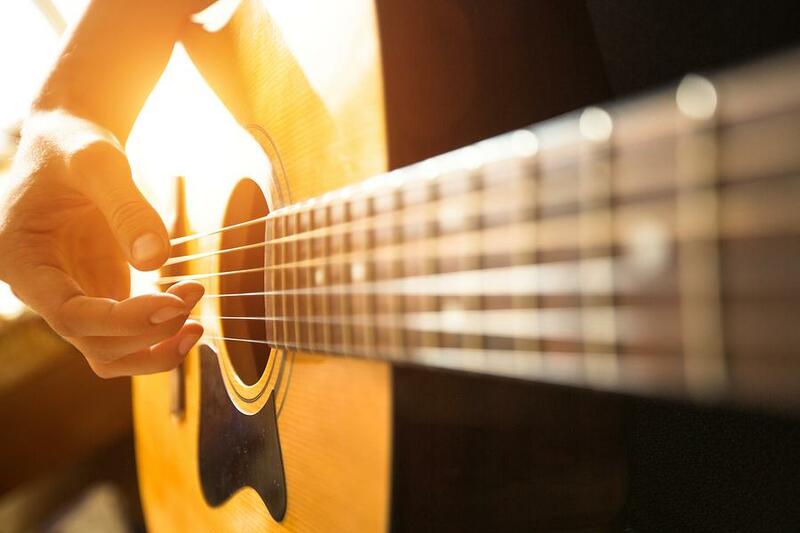 While some of these materials might be quite costly, you can still get the best inexpensive acoustic guitar that features selected wood that gives the instrument a distinct sound that you’ll learn to love. When it comes to the best affordable acoustic guitar models, spruce and Sitka spruce, in particular, is the preferred material for tops. The bridge and neck are usually made of rosewood, and the sides as well as the back from mahogany. However, each of these wood types has different properties so a guitar can use mahogany for its top to produce strong sounds that are usually in the high-end range of notes, while spruce has good all-around qualities, although each particular species of spruce has different colors and sound characteristics. Whether you plan on playing at gigs or recording music at home, you might want to go for the best cheap acoustic electric guitar you can find. While this is still an acoustic guitar, it comes with a pickup system that is located inside the body. This system picks up all the vibrations from the soundboard and then transforms them into electronic signals. Because these might be quite weak with many models, some guitars also feature a preamp which amplifies these. A preamp has buttons to control both the volume and tone. With an acoustic-electric guitar, you’ll be able to play live and control your tones and sound, as well as have the ability to plug it into an audio interface and even record what you’re playing. When the guitar is not plugged in, it will still sound like a normal acoustic guitar. You also won’t need to buy microphones to fit inside the guitar or risk having room noises affect the recording. Female hand close-up playing on acoustic guitar. There are loads of models out there, each with their specific qualities, sound characteristics, etc. 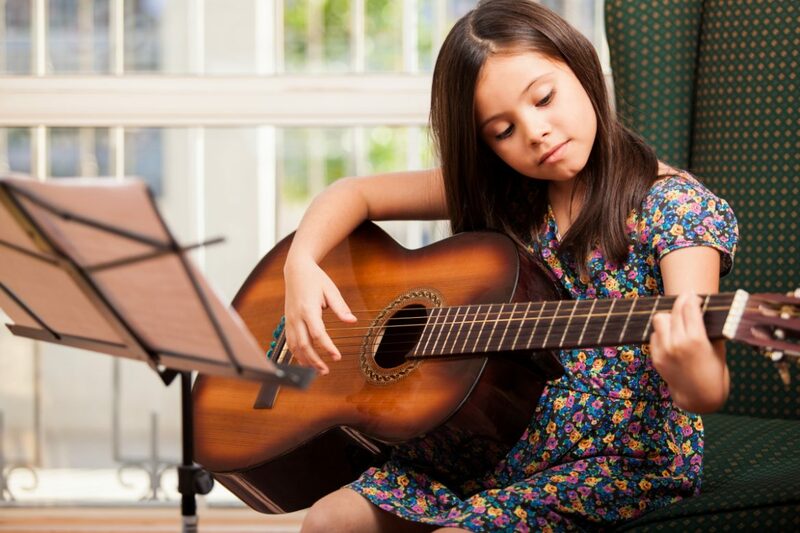 The good part is that you don’t have to break the bank to get a good musical instrument, as you can easily get by with the best acoustic guitar for under 300. You won’t need to skimp on quality by getting one of these affordable models, as they’re still made according to high standards. You also don’t need to overspend on a guitar if you’re just starting out. You might not follow through with this passion, and it would be a shame to invest a load of money into a guitar you might not use. You’d also benefit from getting an inexpensive guitar since you’ll be able to go for a simpler model that’s easier to play, and you can experiment without fear. You should also remember that the best guitar is the one you play the most so choose a model that’s suited to your skill level, style, as well as preferences. When searching for a good acoustic guitar for the money, you should also consider accessories that you may desire or require in the future. You could get a gig bag for safe and easy transport, a guitar strap or a stand for convenient playing or storage between sessions, extra picks, strings, and other things that will make your life easier when playing this beautiful instrument. Can You Play Guitar with Small Hands? What Is a Violin Bow Made Of? sound-unsound @ All Right Reserved.